WILL THE NEXT SEAHAWKS OWNER BE AS GOOD AS PAUL ALLEN? 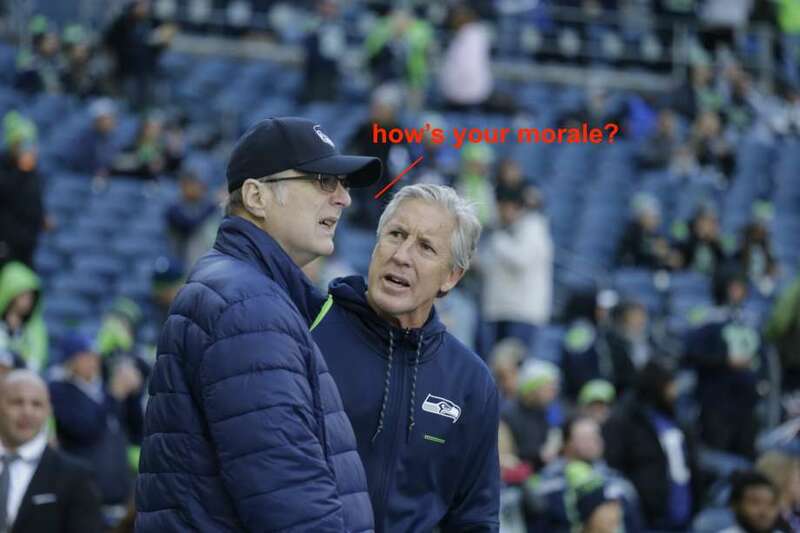 » how's your morale? The Seahawks are going to be sold soon, now that Paul Allen has died. To me, the Seahawks are one of the best parts of Allen’s legacy. He was a good team owner, if not the best in the NFL, over his tenure. During Allen’s ownership, team appeared in the Super Bowl three times and won once. In the 20 full seasons that Allen had control of the team—1997-2017—the team had a winning record overall, and had only six losing seasons. They went to the playoffs twelve times. Leaving aside larger problems with the NFL, that is a remarkable record. Allen succeeded because hired talented, smart people to run the team. Then he gave them the money, resources, and patience they needed to succeed, which they did. Mike Holmgren and Pete Carroll are two of the finest football coaches to wear the headset. Allen recognized that—which wasn’t all that hard, since both had achieved significant success before coming to Seattle—and empowered both coaches appropriately. Allen was not just successful. He was unusual in this particular regard: Paul Allen was a good team owner because he bought the team and then stayed out out of the way. Team owners are the appendix of pro sports. Owners serve no function, and the only other thing they can do besides nothing is actively hurt you. They mess up player personnel decisions, cheap out in a booming business that prints money, or extort cities into paying for stadiums that the public can’t actually afford. (Each of those links are to separate instances of bad behavior by different team owners. Mostly they’re from different teams—except for the continued pattern of incidents that show the Florida Miami Marlins are basically a Ponzi scheme.) Owners are forever screwing around with team decisions they do not understand, like the George Steinbrenner of Seinfeld. They are racist, leering, tightwad goblins, like Donald Sterling, or petty trust fund idiots like Jim Dolan, or the actual George Steinbrenner, who was convicted of a felony from his bit role in Watergate. The athletes play the games, and the coaches and front offices assemble the teams and plan strategies and tactics. Those people create all the value, culturally and economically, of sports. Owners add nothing. Nobody buys tickets or tunes into a game because they’re rooting for Woody Johnson, even though men like him think that the whole enterprise revolves around them. Anyway, Seattle and Portland are lucky that Allen didn’t act like that. He ran the Seahawks and Trail Blazers in good faith, as a public trust. In exchange, he happily counted his stacks of money, and sat in the best seats for no additional charge. He realized that the best thing he could do was nothing. There are spectacularly successful alternatives to the single owner, rent-seeking model of sports business that is popular in the United States. Juventus, the premier Italian club, is publicly traded. Real Madrid and Barcelona, arguably the most successful (and definitely the most lucrative) professional sports organizations in the world, are privately held corporations, like most sports franchises here. The difference is their structure: they have large investor groups, rather than one feudal-type owner. They have boards of directors and club executives who are accountable to an investor pool, like any normal company. None of those teams have ever threatened to move, and tend to pay for their own stadiums. They have no trouble winning mountains of trophies and earning lots of money for their investors. They are modern, profitmaking corporate enterprises, and are run as such. Manchester United, another elite soccer club, is an interesting test case for these competing systems of sports team governance. An American rich dude, Malcolm Glazer, bought the team in 2003, after the club had been public since 1990. During the ’90s and through the turn of the century, United enjoyed perhaps the most successful decade of any soccer club in history. After Glazer bought a controlling interest in the team, their fortunes have notably declined, as Glazer has used the team as his personal piggy bank/fiefdom—essentially, he imported U.S.-style, one dude team ownership. He knows all about it: Glazer’s other main achievement is screwing up the NFL’s Tampa Bay Buccaneers. These modern arrangements, in which sports teams are run as normal enterprises and not monuments to one rich guy’s ego, are not limited to Europe. The Toronto Maple Leafs are a public company whose controlling interest had been owned by a big pension plan; now it’s jointly controlled by telecom Bell Canada and cable company Rogers Communications. They famously have not won anything since the ’60s, but they one of the two most popular and lucrative NHL franchises. The Green Bay Packers are a privately held non-profit corporation, owned by Green Bay residents and other longtime fans. They are one of the NFL’s most accomplished and popular franchises. The sole owner model is feudal, an archaic system in which one person can play games with the people who have sworn allegiance to him. Sometimes, the person on top is even a man who inherited the team through primogeniture (though sometimes girls inherit, or marry into it.) The liege lord can make all sorts of dumb or harmful decisions without any fear of consequences, unless the other peers come for him. Here’s what will happen with the Seahawks. A group of self-important rich guys (and it will be all guys) will fight for the privilege to spend at least $2 billion to buy the Seahawks. One of them will be chosen by the other thirty one owners, because the new guy fits into the rich guy club. They will split up that $2 billion thirty-one ways—$64.5 million apiece—just for showing up. Most likely, the new owner will run the Seahawks into the ground, while making back what he made and millions more. Maybe he will threaten to move the team to San Antonio or San Diego, if he feels like it. If he does, he will pull out all the usual tricks. He’ll argue that the team can’t compete financially, or maybe that a new stadium will be an economic boon. Neither will be true. But one thing will be: owning a pro sports team is a great racket.